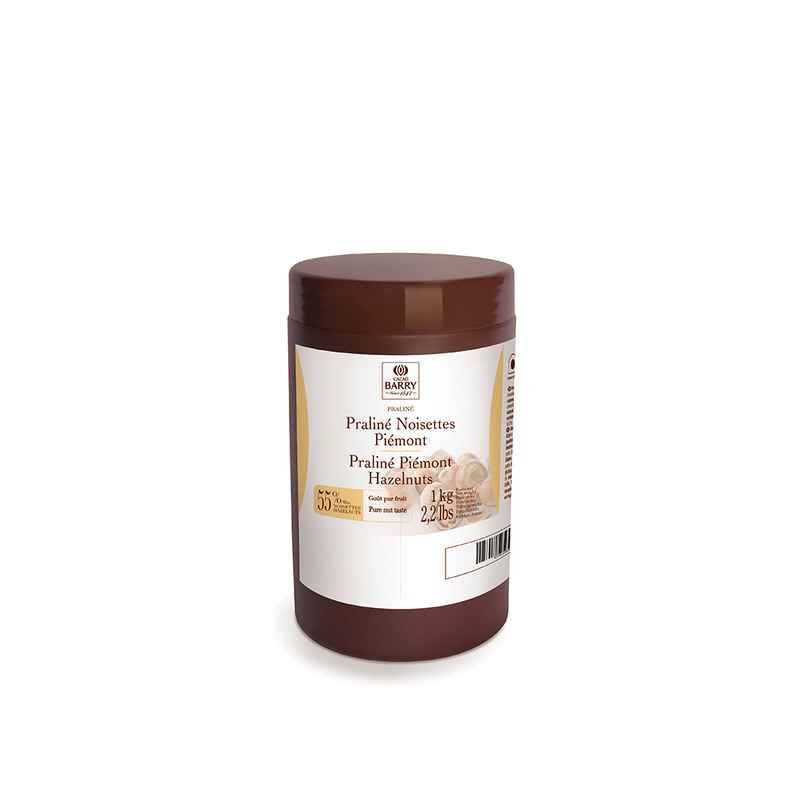 This praliné seduces by its blond colour and by its strong and pure Piémont hazelnut taste. These nuts are lightly roasted to offer you all the richness of Piémont taste. Lightly roasted, and pale caramel in colour, our 100% fresh almond paste delivers a delicate, depth of flavour ideal for anything from crémeux and sauces, to ice-cream. All the nature, without the extras! A luxurious blend of the finest, caramelised almonds and hazelnuts, this medium roasted, 65% praline, is perfectly balanced in flavour. The crisp, nuggets of caramelised nut, embedded in smooth, vibrant gold, will add texture to any confectionery concept. 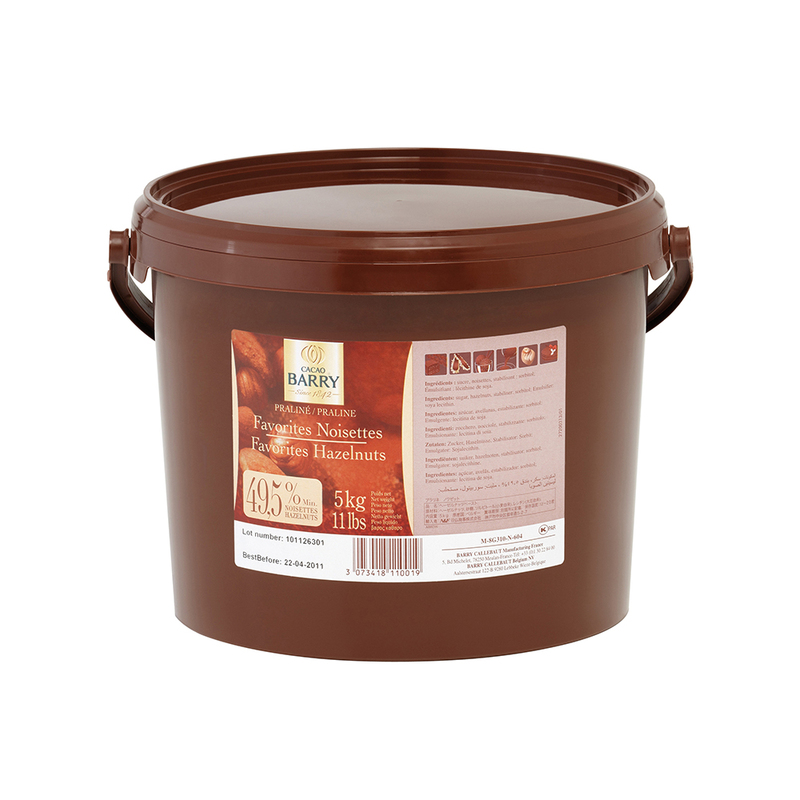 This silky smooth, 50% praline, contains only the finest caramelised hazelnuts. Medium roasted for a rich flavour, and unique golden colour, it’s deliciously sweet, convenient, and ideal for decoration. 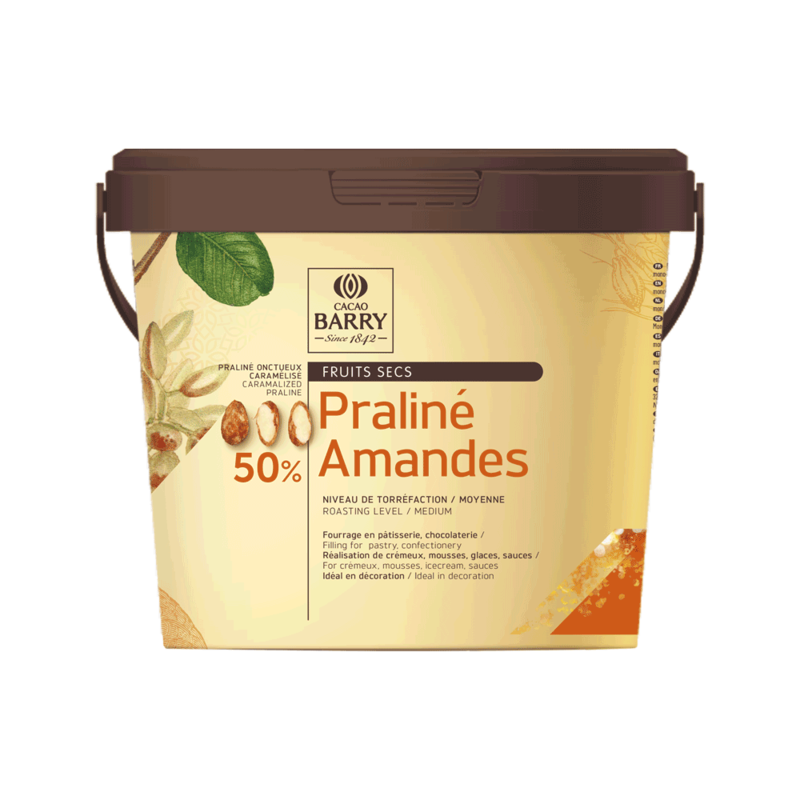 50% lightly, roasted almonds, and 50% pure indulgence; this almond praline has a delicate flavour, and a pale golden colour. Add depth and interest to mousses, icecream and sauces, or use it to decorate your pastry creations. 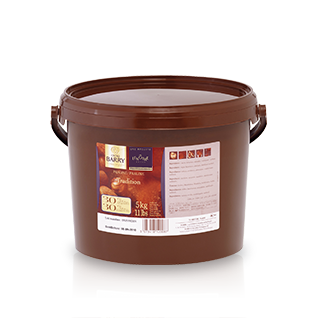 A velvety combination of the freshest almonds and hazelnuts, this medium roasted, 50% praline is tinted vibrant gold. With a balanced, depth of flavour, and a smooth finish, if Paris-Brest is on the menu, this is your only option. 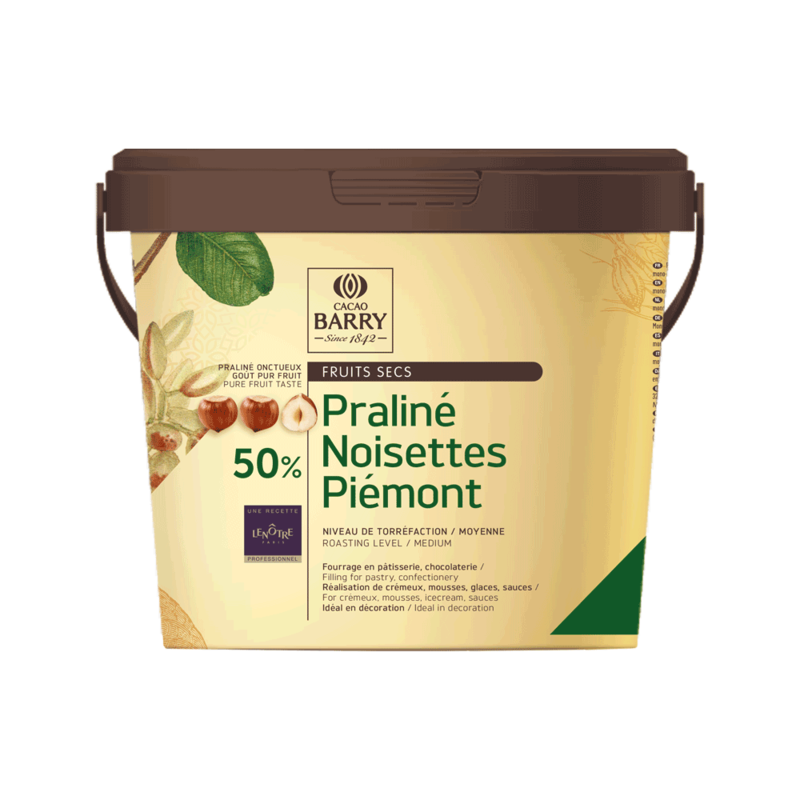 Refined, rich and Italian in origin, this 50% praline, contains only the most exceptional hazelnuts that Piémont can grow. Medium roasted for balance, and caramel in colour, it’s as versatile as it is unique. Aromatic, Valencian almonds are gently roasted to create this unique, 50%praline. Pure in flavour, light golden in colour and silky smooth, it’s ideal for pastry, chefs and conceptual confectioners alike. 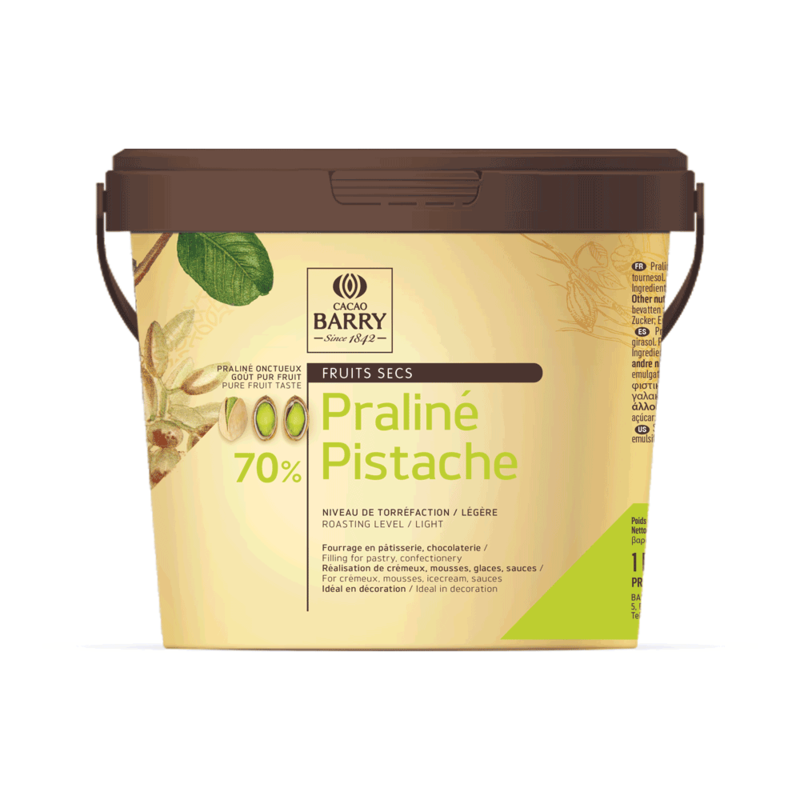 Deliciously unique, this 70% pistachio praline has a vibrant, green appearance. Grown in Mediterranean, and lightly roasted for a fresh, authentic flavour, it’s perfect for crémeux, icecream and sauces, and ideal for decoration.